Rates for airmail letters from Hawaii to Europe were twenty cents more than the airmail rate from the mainland until November 1, 1946. The airmail rate from Hawaii to the mainland was twenty cents from April 21, 1937 until January 15, 1945. 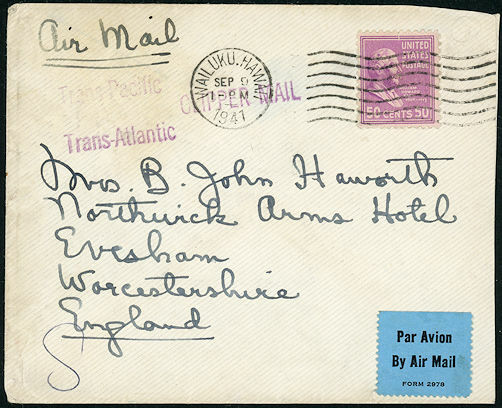 This cover was mailed from Hawaii to England in 1941 with postage of twenty cents from Hawaii to the mainland and thirty cents from the mainland to Europe.